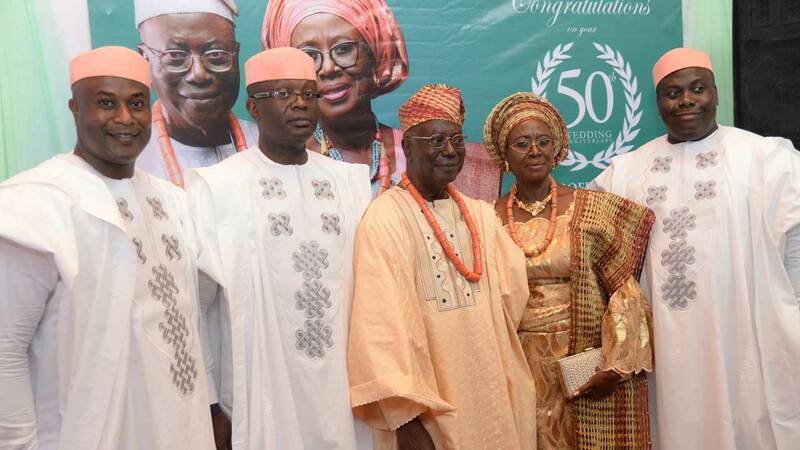 Professors Enosakhare Samuel Akpata and Victoria Akpata celebrated their 50th wedding anniversary recently with a dinner at the Metropolitan Club in Victoria Island, Lagos. Samuel, who is a retired professor of Dentistry, got married to Victoria, also a retired professor of Microbiology of the University of Lagos, in December 1968. Climax of the dinner event, attended by the crème de la crème of the academia, business and corporate world, was the unveiling of the latest book written by Samuel, Sand, Sun and Surprises, a memoir that focuses on his experiences while living and working in the Middle East (Saudi Arabia and Kuwait to be precise) for 23 years. Some of the dignitaries at the occasion include Chief Arthur Mbanefo, a former Nigerian representative at the United Nations (UN), who chaired the occasion, Professors Osato Giwa-Osagie and T.A. Junaid, friend and colleague of Samuel at Kuwait University; Rev. George Bako; retired Bishop of Lokoja (Anglican Church of Nigeria), Solomon Uwaifo; Chief launcher of the book, Air Vice Marshall Joe Ehigie (rtd); Professor Gabriel Osuide, pioneer Director General of NAFDAC; Dr. Edugie Abebe and many others. Samuel worked at the University of Lagos for 21 years before he moved over to King Saud University in Saudi Arabia, where he taught for 13 years and then to Kuwait University for 10 years, all as professor of restorative dentistry. On his return to Nigeria, he also worked at the Lagos State University for about three years. Speaking on the factors that contributed to the success of his marriage, Samuel said: “The key thing, in our own case, is openness. We discuss issues even with the children. If there is an issue between us as a couple, we allow each person to talk about it. We have never gone to a third party to settle any matter. We feel that there is no issue we cannot iron out between us.” The Akpatas are blessed with three sons and six grandchildren.